Buckingham Palace, the home of The Queen is open to the public this summer from Saturday 25th July 2015 to Sunday 27th September 2015. 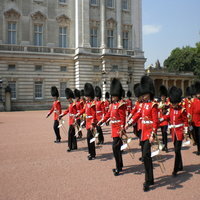 It has been the official London residence of Britain's sovereign since 1837. It was once a townhouse owned by the Dukes of Buckingham back in the eighteenth century. George III bought Buckingham House in 1761 for his wife Queen Charlotte to use as a family home near to St James's Palace, where many court functions were held. The State Rooms at Buckingham Palace have been opening to the public for the Annual Summer opening, in August and September, since 1993, after the fire at Windsor Castle in November 1992. Initially the Summer Opening was considered a way to pay for the damage at Windsor Castle, but it became so popular The Queen has continued to allow visitors every summer. The Queen is not at home during the Buckingham Palace summer opening. She resides at one of her other country residences during the summer. Experience A Royal Welcome at the Summer Opening of Buckingham Palace. Buckingham Palace has 775 rooms. These include 19 Staterooms, 52 Royal and guest bedrooms, 188 staff bedrooms, 92 offices and 78 bathrooms. In measurements, the building is 108 metres long across the front, 120 metres deep (including the central quadrangle) and 24 metres high. If you visit you can see many royal wall art treasures, collectively known as the Royal Collection. Amongst the Buckingham Palace wall art are paintings by Rembrandt, Rubens, and Canaletto. All wall decoration is achieved using the finest materials and craftsmanship. The large wall art decorations are a combination of fine art plaster work, rare wooden wall art and precious metals such as gold leaf and bronze. The rich red tapestry that lines the route to the upstairs rooms, achieves a truly royal feel. I don’t think that you would fit this royal, priceless and large wall art into the average home, even if you could afford some of it. Don’t worry there is no need to, just take a look at the regal and luxurious wall art at Brilliant Wall Art, including metal wall art…all at low, affordable prices. Take a look at the classic and contemporary canvas prints, or our superb range of wall clocks. Our brilliant wooden wall art sculptures are a great natural way to decorate any room. Why not visit our Facebook page, Like us and receive BRILLIANT offers and 5% off your next purchase. If you have any questions about our wall art treasures, please do not hesitate to contact us today.